Crude oil prices traded higher in the past fortnight although manufacturing growth has faltered in Europe and China at a time of ample supply. On a fortnightly basis, global markets traded on a positive note on the back of optimistic economic growth in the US, the world's largest economy showing signs of progress. Further, news of a cease fire agreement between Russia and Ukraine eased geopolitical concerns, which supported an upside in the markets. During the end of the fortnight, markets corrected as the European Central Bank (ECB) unexpectedly cut key interest rates to an all-time low. On the domestic front, markets traded higher as a result of inflow of foreign funds in equities and debt markets totaling $30.6 billion in the current year. The Indian rupee appreciated by around 0.2 per cent owing to domestic equities reaching an all-time high levels. Further, optimistic economic growth in Q2 of 2014 along with selling of dollars by custodian banks acted as a positive factor. However, strength in the dollar index and rise in the Current Account Deficit (CAD) for (April-June'14) capped a sharp upside movement in the Indian rupee. In the non-agri commodities space, spot gold prices largely traded in a negative territory as economic data released from the US signals growth in the economy. The Conference Board's measure of U.S. consumer confidence rose more than expected in August, hitting its highest level since October 2007. Separately, orders for long-lasting U.S. manufactured goods posted their biggest gain on record in July. In the ECB meeting held on September 5, the ECB unexpectedly cut already ultra-low interest rates by another 10 basis points and said the central bank would start purchasing securitized loans and covered bonds next month. The ECB is under strong pressure to tackle stubbornly low inflation at a time when the conflict in Ukraine threatens to destabilise the region's fragile recovery. Also, the metal was under pressure after Russian President Vladimir Putin outlined plans for a ceasefire in eastern Ukraine, but Ukraine's prime minister later dismissed the proposal as Russia's attempt to deceive the West on the eve of a NATO summit. Overall, spot gold prices declined by around two per cent in the last fortnight, while MCX gold prices declined by around 1.2 per cent. Spot silver prices traded lower in line with weakness in gold prices and declined by around two per cent last fortnight. Strength in the dollar index, coupled with profit booking at higher levels, acted as a negative factor. On the MCX, silver prices fell one per cent. During the last fortnight, LME Copper prices traded lower by around two per cent as weak manufacturing data and an investigation of the power grid in China raised concerns about the outlook for demand from the world's top metals consumer. Also, Newmont Mining Corp planned to resume copper concentrate exports this week, thereby fuelling investor concern that further supplies were coming to the market. However, signs of strengthening economic recovery in the U.S., the world's second-biggest consumer of industrial metals, restricted a sharp fall. Further, miner and metals trader Glencore forecasted strong demand for copper from both China and the West in the latter part of this year along with the ECB cutting interest rates, freeing up capital for industry and investors supported gains. 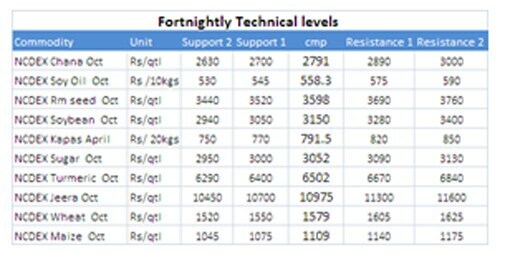 MCX copper prices have fallen by 0.2 per cent in the oast fifteen days. Crude oil prices traded higher in the past fortnight although manufacturing growth has faltered in Europe and China at a time of ample supply. The risk of production setbacks remained high in Libya where the government has lost control of most of the capital. In the euro zone, manufacturing growth slowed more than expected last month and factory activity in several key countries appeared to be stagnating. French factory output fell at its fastest pace in 15 months in August. Chinese factory growth slipped to a three-month low in August as foreign and domestic demand cooled, and the country's huge construction sector is also seeing a slowdown, muddying the outlook for demand. Overall, WTI oil prices gained marginally by around one per cent and MCX crude oil gained by around 1.1 per cent. In the coming fortnight, we expect precious metals to trade lower as the economic data released from the US is indicating that growth is evident in the country. Besides, prospects of easing tensions between Russia and Ukraine will also exert downside pressure. Crude oil prices will trade higher on bargain buying at lower levels. Good economic data from the US will lead to increased demand for crude acting as a positive factor. Base metals are likely to trade sideways as strong improvement in the US labour market will support metals demands. Also, monetary easing by the ECB will support gains. On the other hand, serious concerns regarding the power grid company in China will act as a negative factor. *Price performance as on 4th September 2014, at 5.00 pm. With improving rains and narrowing kharif sowing deficit, almost the entire agri commodities basket remained negative to bearish over the last fortnight. However, for the season as a whole, rains continue to remain below normal. As per the data from the India Meteorological Department (IMD), the cumulative rainfall for the season till September 4 was 14 per cent below normal at 635 mm compared to a normal of 741.7 mm. According to the Ministry of Agriculture, kharif sowing as on September 4 was reported 3.35 percent lower at 98.66 mn ha as against 102.08 mn ha during the corresponding period last year. Sowing of pulses, oilseeds and coarse cereals declined by 6.2 per cent, 8.2 per cent and 9.1 per cent while that of cotton increased 9.4 per cent, respectively. Water levels in the 85 major reservoirs are below last year's levels but higher than the 10-year average. As per the latest data available from the Central Water Commission, the levels in the reservoirs were reported at 110.5224 billion cubic metres as against a full capacity of 155.046 billion cubic metres. NCDEX has postponed the launch of future contracts coriander and castor seed 1 MT (Jan '15), chilli (March '15) and turmeric (April '15). The exchange has also decided not to offer futures contracts in gur expiring March 2015 onwards till further notice. The edible oilseed complex witnessed a steep fall in prices due to weak global edible oil prices and improving rainfall. Soybean declined 7.9 per cent tracking a pickup in sowing, good rains in the soybean regions, poor soy meal export demand and weak overseas markets. Soy oil and CPO declined 2.1 per cent and 3.8 per cent, respectively, taking cues from weak global edible prices. Appreciation in the rupee also added to the downside pressure. Mustard seed was the only gainer in agri-commodities, posting two per cent returns on good demand for mustard meal exports and declining arrival pressure. However, weak soybean prices capped the upside. Among spices, turmeric was the biggest loser with 3.8 per cent losses due to higher sowing in Telangana and weak demand in the spot markets. Jeera lost 2.5 per cent on sluggish demand from overseas buyers as well as huge carryover stocks. However, lower-level buying and demand from China supported prices. Coriander declined 1.3 per cent on sluggish domestic demand and lack of fresh export orders at higher levels. Among soft commodities , sugar prices largely remained weak on sluggish physical demand, abundant supplies, selling pressure from the mills and weak overseas markets and settled 1.7 per cent lower. Cotton resumed its southward journey after witnessing short covering last month and declined 3.9 per cent. Prices continued to decline on higher sowing, favorable climatic conditions and expectations of a record output. Bearish sentiment in the global cotton market also added to the downside pressure on prices in the domestic markets. Chana futures gained initially on lower-level buying and festive demand. However, prices declined sharply from higher levels and lost 3.6 per cent on comfortable stocks due to a record output in the 2013/14 season. In the coming fortnight we expect most agri commodities to remain weak as improved rains and narrowing sowing deficit may keep prices in check. 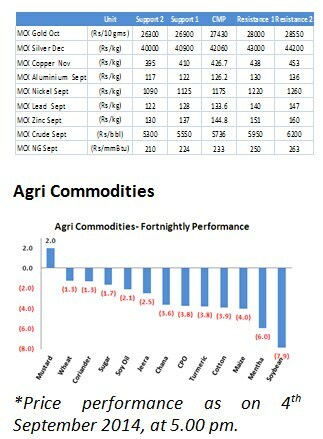 Agri commodities prices in global markets also are in bearishness due to good rains, favorable climatic conditions and the spillover effect can be seen in the domestic markets. However, no sharp downside movement is seen as demand is expected to emerge at lower levels ahead of the upcoming festive season. Prices are also likely to take cues from movement in the overseas agri commodity prices as well as the Indian rupee. Also, the monsoon season is in the last month and now we need to carefully track the start of withdrawal of monsoons. Delayed withdrawal or unseasonal rains may lead to crop damage. Prices are also expected to take cues from market estimates of kharif output by the government as well as various private forecasters.